Neil Perry hardly needs an introduction and we had high expectations from his newcomer Rosetta. 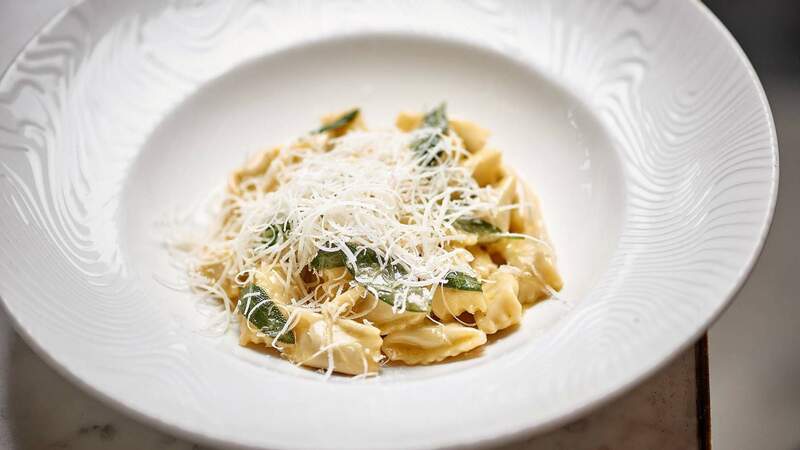 Rosetta steers away from anything Perry has done before by delving into all things Italian. The picturesque Southbank location is a haven of Italian hospitality. Big, bold and warm. Red and whites dominate the interior, with a sleek marble bar to perch at while indulging an aperitif and some pasta. And of course we shouldn't surprised by some handsome Italian waiters. The menu is in keeping with traditional Italian dining with dishes categorised into antipasto, crudo and carpacci designed for sharing — try the meat balls baked in tomato sauce ($19) or Prosciutto San Daniele with parmesan and cabbage ($29) — and up to 16 handmade pastas. Then there's the all important mains. We started with the fried squid and zucchini ($32) and the braised tuna with green peppers and faro ($29). The tuna was a standout; the dish was a clean and simple opening. With up to 16 fresh handmade pastas on offer we couldn't resist. The lamb and pea ragu ($29) form Piemonte will transport you to Italy in a moment sans the passport. Moist milk fed lamb is cooked with garlic and peas and served on long thin pasta. It manages to be the anticipated balance of rich, creamy and light. The prawn and pistachio pasta ($35) from Sicily, cooked with a prawn stock shines with fresh seafood. For mains, choose from a salt cod with chickpeas, tomato and chilli ($39) or a wood roasted twice-cooked duck with peach, served on the rare side ($45). Don't go past the traditional Piemontese chocolate pudding with coffee, rum Amaretto biscuits and caramel if you are leaning towards a rich sweet finish. Pair it with the 2006 Vinsanto ($18 glass) from Tuscany for true decadence. A delicate strawberry and rhubarb panna cotta is a lighter option while a cheese platter is also a welcome finish to the meal. The extensive wine list is broken down by region for a true tour of Italy. With 13 wines by the glass and a knowledgeable sommelier, you're sure to find a suitable tipple. An outside dining area on the bank of the river is an exciting prospect for summer. "I can't wait to sit outside in the sun with a Negroni or two," Neil told us. We hope to join you, Neil.